A wonderful member of the CLF has made a very important point on the CLF Message Board on Ravlery. There seems to be a rut in design happening. Now let’s not blame the designers over much, but we have to acknowledge that because of poor wages a designer has to crank out multiple designs at lightning speed to make any kind of earnings at all. 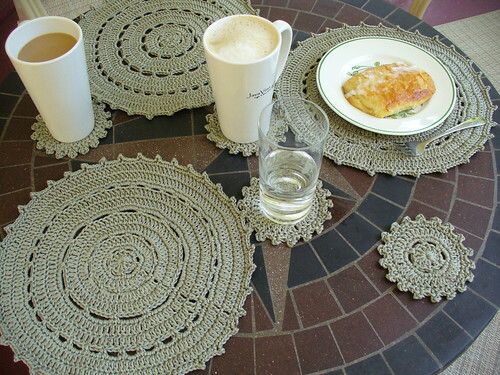 This is not grand for creative expression, and it is a sad fact of our crochet industrial world. On the other hand, publications are not willing to be daring and risky in the designs they publish, and back to what they are willing to pay for something HOOKALICIOUS: Not much. They are also afraid of innovation, because what worked last decade must work in this one, right? WRONG. Sad really. One of the issues we’re facing, and not to discourage budding new designers in the least, is the amount of people with stars in their eyes to be published as a designer and they put up a rather simple double crochet (dc) or single crochet (sc) scarf or hat into the pattern upload, for free or not for free and flood the pattern searches with things that, may or may not be attractive, but aren’t innovative. Now, again I do NOT want to discourage our budding designers however I do want to encourage you, the budding new designer, to stretch your wings and do something EDGY, do something exciting, do something daring if you are going to publish. After all, we all want to be published out of some kind of desire…the desire to be known, to share our knowledge, to share our creativity, to be seen, to show off our skills and creative abilities. Find your motivation and then DARE! Dare to be creative, avant-garde, out of the box, create fabulousness…and then…wait for it…wait for it! The internet is FLOODED with free content, some of it is great, some of it is rubbish, and some of it is just ok. I have seen free patterns that are DIVINE and frankly should NOT be free! If you want to design, that is an occupation that is worthy of compensation, if you aren’t prepared for success, then make a plan and get ready and go for it! Crochet needs designer leaders, and we have some of those for certain! But you too could be a leader in design…you could be more, design more, and create more…we can all benefit from more creativity…from diversity…from something out of the box! So, promise me this in 2011, GET OUT OF THE CROCHET BOX and FLY!!! Ok, be prepared, my mind is solely focused on the Crochet @ Cama Retreat! You will be hearing a lot about it from now until the end of September. Why? Because I am a) excited b) I talk about things I’m doing. Todays post is featuring the work of our fabulous teachers, Karen Whooley, Deb Burger, Jim “Jimbo” Price, and Bonnie Pierce, and yeah me Laurie Wheeler. There is still time to sign up for classes, I would hate to have to have any cancelled due to a lack of sign ups, and I would also hate for you to miss out because the classes are full! You must sign up for the retreat or purchase a day pass (coming soon) in order to sign up for the retreat! So do it today! Karen Whooley will teach a class on Fair Isle Crochet. You’ll be making a swatch, not this huge afghan but I just love this photo! If you click the photo it will take you to the project page on Ravelry. Karen is a gifted crocheter and a wonderful instructor, she has a very clear and concise way of teaching and infinite patience! Karen is also teaching a class on beginning crocheted lace. Whether you’re working in yarn or thread, you can learn some very simple stitching techniques that can lead to beautiful objects like those pictured above! How to crochet socks from the toe up are also being taught by Karen at the retreat! Don’t miss an opportunity to learn Karen’s tips and tricks! You’ll love it! 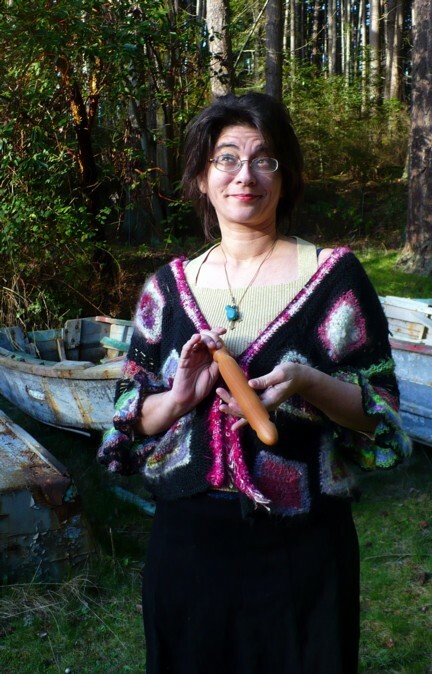 Internationally celebrated, Bonnie Pierce is a gifted crocheter and Free Form Diva! 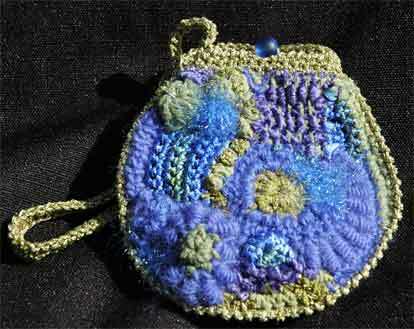 She is offering a three hour class on Beginning Free Form crochet that you just don’t want to miss! Photographing you Finished Object! With Deborah Burger. Deb is a great photographer, and is teaching this short class on photo techniques for crocheters twice at the retreat! You want to sign up if you want your photos to pop online in your Ravelry projects page, or if you are trying to get published professionally, and especially if you sell your own patterns independently! Deb is also a gifted and talented crocheter and instructor with vast amounts of teaching experience! She and her husband are coming all the way from North Carolina to join us at the retreat, so sign up for her class! Trust me you’ll love the experience! Whittlin’ is what Jimbo does best…or so he says, I personally think he does a great many things well! I have played with his hand turned hooks, and own a few 😀 Jim is offering two fabulous classes on how to whittle your own hook and our most subversive class yet! How to turn a bamboo needle into a hook! I can not wait for that one!! This is me and Dippy crocheting together 😀 Dippy is accompanying Jim to the retreat…you too can crochet with Dippy 😀 Check out Jim’s blog to see his stunning work and know that we’ll be in safe hands when we learn to whittle! 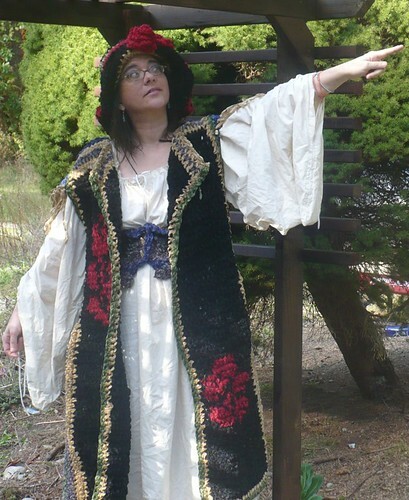 This pirate outfit or a motif jacket or a bag or purse or scarf…Yes, I did NOT use a pattern to make that over coat ;D I’ll give you some really easy and simple information to take your crochet into confident new territory! All about the yarn will help you get there too! Learning about your materials is important! In fact to add to that class experience if you go to my lulu.com store you’ll find the Secrets of Yarn Guide which is the platform for the All about The Yarn class 😀 It’s inexpensive and really useful! I’ve found a further activity for us, as a member of the community on Camano Island expressed interest in the Coral Reef Project, well heck we’re on Puget Sound, we can make a Crocheted Sound-Scape! How cool is that, and man do I have lots of yarn to share with you all! So imagine this: We’re having a “Yarn Tasting”, Crochet Fix It Clinic, Dye Workshop, Afghan Making for Center for Wooden Boats (Our partner), our local LYS in Stanwood, WA Pinch Knitter Yarns is hosting a private party for us on the Monday during an extended lunch time!! Can you believe all of this? Plus evening speakers and games, it’s all crochet, it’s all the time…Heck it’s a forward kind of retreat! Now to take these fabulous classes you MUST sign up for the retreat! So do it quick, the price goes up to $95 on Sept. 2! Get your early bird deal NOW!!! Only $75! Yesturday was my birthday, my gift from husband was a trip out to my favorite bookstores, which is a long drive through pretty country side. This one book store has all manner of treasures, I know if I’m looking for something funky, out of the ordinary, or a subject that has little information on it, this used book store will have it at some point. Today I scored crochet gold! I found two older crochet books, one from 1948, hardbound even, entitled “The Complete Book of Crochet” by Elizabeth L. Mathieson. It’s a fabulous book for the crochet historian to possess. I’m honored to be it’s latest keeper! The second book I found is PROOF of all that I have been requesting in books on crochet!! It’s entitled, “America’s Crochet Book”, by Gertrude Taylor. Published in 1972 by Charles Scribner & Sons. This book has it all from how to learn crochet with some of the best written instructions I’ve ever seen, (Lefties beware though, the antiquated view on left handedism is present but the other information is so worth skipping that vingnette). Shaping of Crochet Pieces: Decreases (in each of the stitches by the way), Increases, Bind off. From starting your first project, to learning how to fit garments and finish them correctly (to make them as polished as anything anyone else purchases!) to instructions for Tunisian Crochet and hairpin lace…this book is an amazing amazing tribute to our craft. The information on fitting garments and how to alter a pattern to fit YOUR body is EXACTLY what we have been asking for, and when publishers say it can’t be done we can now point at this book and blow them big raspberries! It can be done! It has been done! And where was this book in my life 20 years ago!!! It’s fabulous! Written in plain Engligh with the beginning garment maker in mind I love this book. Here’s a sample of some of the encouraging text! Have I been channeling her? Is she still around? Does anyone know her or did know her in real life, because I want to make sure some one hugs her on my behalf! I love, love, love this book and it is now my brand new favorite of all time! Did I mention it’s in mint condition, dust jacket and all? Oh yes, it shall have a hallowed place in my home. 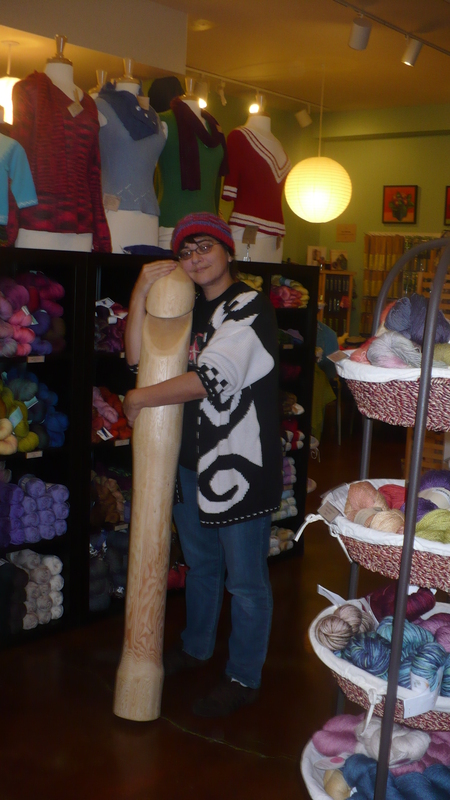 I want to thank all the wonderful folks on the CLF message board on Ravelry, and on Facebook for the birthday wishes! How lovely to be thought of! A reminder to you all the Crochet Liberation Front’s 3rd birthday is July 27th, what do you want to do to celebrate? Recently I asked on the CLF Facebook fan page, “Do you crochet hats? Do you wear them besides in winter?” The responses were quite amazing, it appears that I am not the only hat loving crochet fiend! So I thought I would ask you guys to suggest hat patterns, mostly for spring, summer and fall…what are your favorites? Well, I’ve obviously not be blogging much, sadly I haven’t crocheted a whole lot either, well that’s not true. I can say I have crocheted but not finished anything of note. I have a broomstick belt that needs another five rows, a half done wash cloth, the back of a sweater, half an afghan, three quarters of a baby blanket, and 1/4 of a hooded cowl on my hooks right now. I’m scattered. I have to say it’s just the way it is right now in life. I’m scattered, my brain is scattered, my life is scattered, and so my crochet is scattered. I attacked my house with a vengence yesturday and cleaned, trying to create order. I mean I have a retreat to finish up, by the way don’t forget to register!! Articles must be written, samples must be finished, and presents need to be whipped out and ends woven in! I’m getting so excited; The Flamies are coming! The Flamies are coming! It’s funny some people have interpreted Flamies to mean we’re putting down crochet, and have missed out on the fact that the standard of the CLF for all members to bear, is the Flaming Hook of Justice! The awards are named after our beloved Flaming Hook. One of the best perks of being FL is the fact that I get to know who won in advance, AND I get to see the wonderful award graphics as they are being made by 3-D graphic artist Darlisa Riggs (publisher and editor of Crochet Uncut). OMG they are so awesome this year, a completely different design to last year, and if I could afford to have the trophies made for real I so would! Beautiful rendering by a very very talented woman, I can not wait until they get unveiled! Darlisa has requested we keep it hush hush until she gives the nod, so this is all I can say right now. What I will say though, is the winners should just be thrilled to have them, beause they are gorgeous! Thank you Darlisa! Check out Darlisa’s work, her art website is linked in the top right hand corner of the blog! Please honor her talents by checking out her detailed and creative work! Don’t forget to tune into to Getting Loopy for the 2010 Crochet Awards: The Flamies. Monday, April 19 6pm pacific/9 Eastern!